The number of high school students participating in Advance Placement classes is rising in Illinois at the highest rate in the nation. 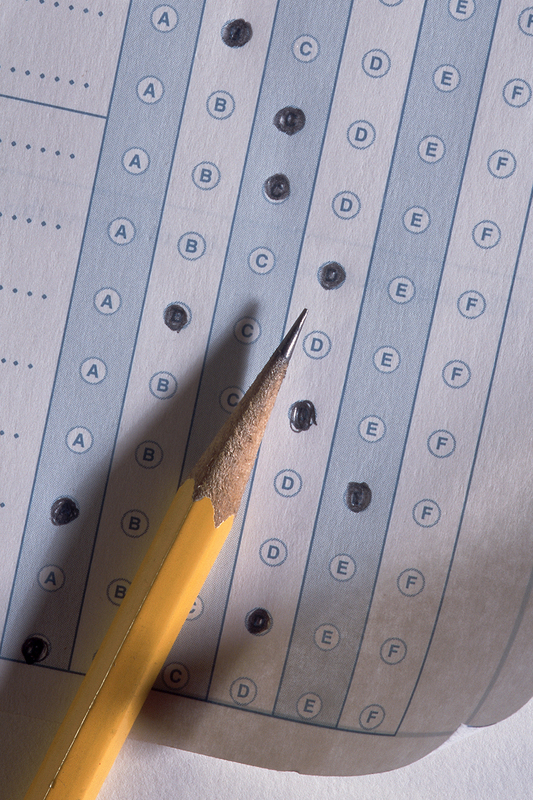 State officials said the increase resulted from a move by the Illinois State Board of Education (ISBE) last year to cover a portion of the AP exam fee for all students who qualified as low-income in 2017. 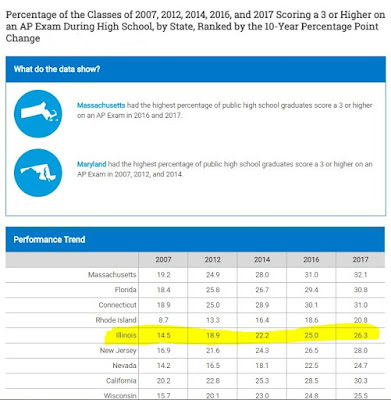 This led to an 11 percent increase over 2016 levels in the number of low-income students taking AP exams over 2016 levels – well above the 7 percent national increase and three times greater than the 3.6 percent average increase in states that did not provide funding, according to ISBE. The Chicago Public School system was also named the national AP District of the Year among all large-sized school districts in the United States and Canada. AP administrators honor one such district in each size category (small-, medium-, and large-sized schools) based on an analysis of three academic years of AP data. With the award to Chicago District 299, Illinois school districts have won AP District of the Year awards in five of the past eight years. ISBE has requested a $2 million appropriation in fiscal year 2019 to continue providing the fee reduction for low-income students and making AP participation possible for all students. The agency also has requested $1 million to expand the AP program to additional schools through teacher professional development and assistance in order for students to enroll and succeed in AP courses. Part of this funding would support the Lead Higher Initiative, whose partnership with Illinois aims to enroll 100,000 low-income students and students of color in AP and International Baccalaureate courses. Additional highlights from Illinois' AP program include: 38.9 percent of Illinois students in the class of 2017 took an AP exam during high school – up from 21.2 percent in 2007; and 63.9 percent of AP exams taken by Illinois students in the class of 2017 resulted in a score of 3 or higher – compared to 56.2 percent nationally. Perform as well as or better in subsequent college courses in the exam discipline than non-AP students who took the corresponding introductory college course. 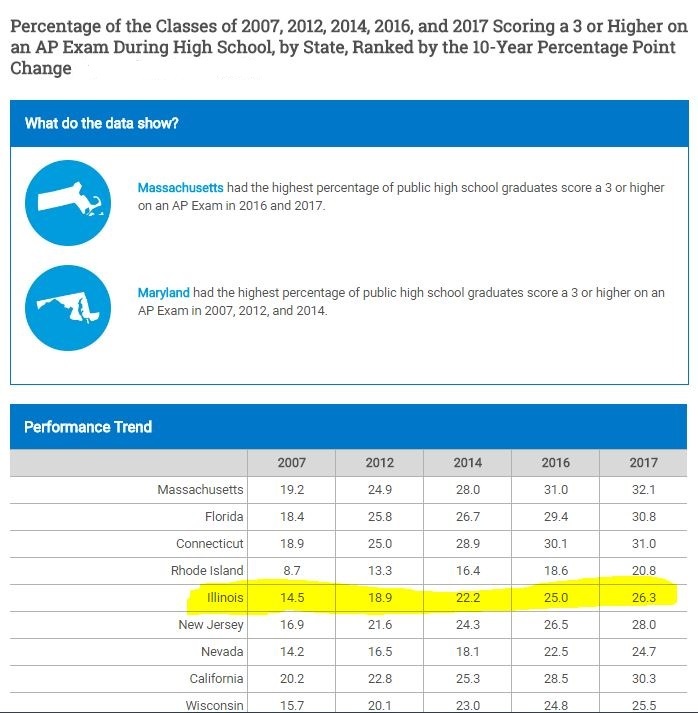 What is more, as the graph below shows, the state is rapidly improving in terms of raising the percentage of its public high school graduates scoring a 3 or higher on AP exams. Illinois ranks fifth-best among states in the ten-year AP performance trend.